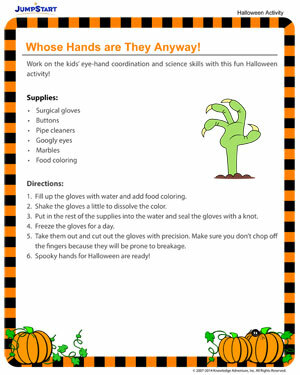 The outcome of this spooky Halloween activity is indeed scary! Imagine a pair of frozen hands lying next to you when you wake up in the morning! How scared will you be! This simple and easy activity will teach the kids a little science lesson on states of matter and allow them to make the spookiest Halloween craft ever!